Friday, June 15th at Noon The Paramount will host David Caldwell Tunes @ Noon Summer Concert Series — YOUNG ARTISTS CONCERT. Each year, students from Bristol and the immediate surrounding area compete an honored scholarship. The students are judged on their musical ability and the command of the discipline. The Young Artists performance will showcase the talent of these amazing young musicians in our region. This program is always an audience favorite. 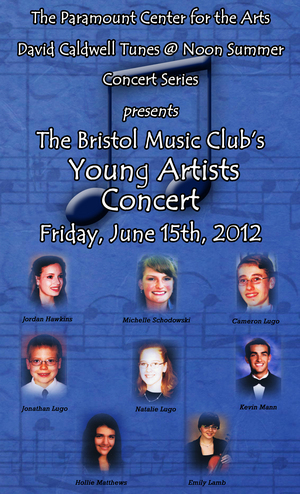 Presented by the Bristol Music Club. Special thanks to the Bristol Herald Courier. Please call The Paramount at (423) 274-8920 for more information.